I’m a Yankee. 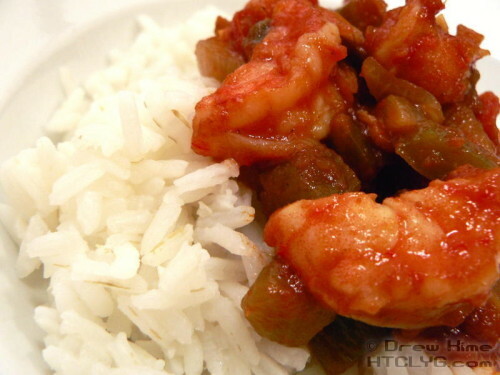 So I have no idea how traditional this version of shrimp creole may be. But it sure is tasty. 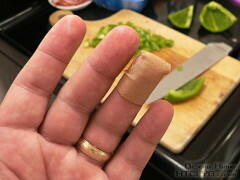 Fortunately the knife was so dull that it only cut halfway through instead of taking the fingertip clean off. Thanks for your concern. 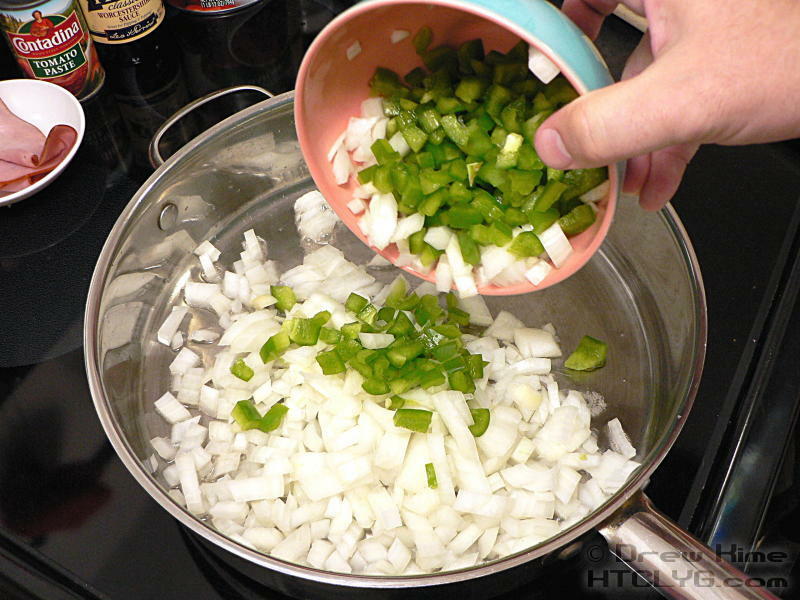 Dice the pepper and onion. 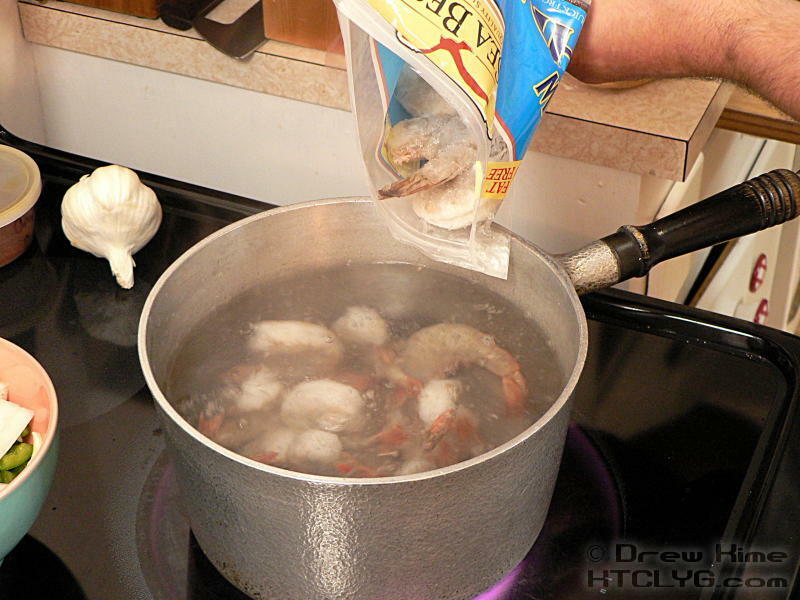 Bring some water to a boil and add the shrimp. 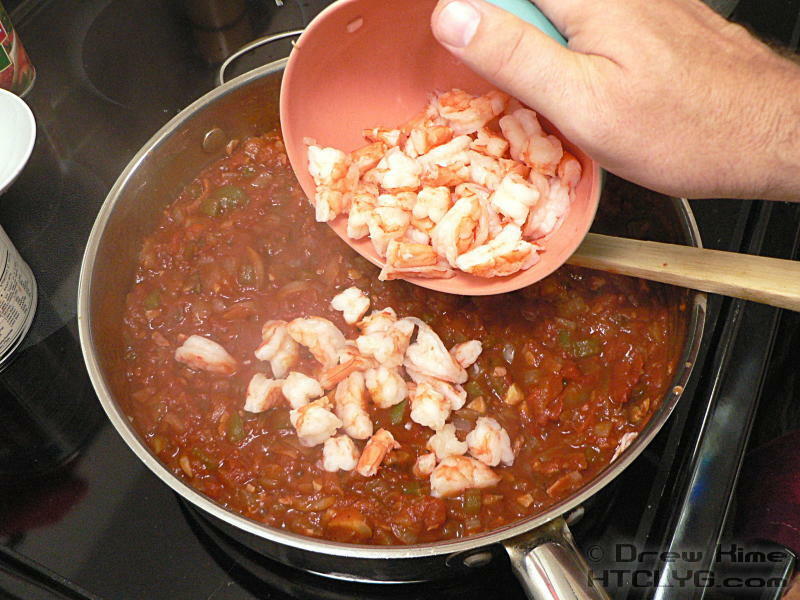 Boil for about 10-12 minutes, until bright red on the edges and there is no gray color left. Drain, and rinse under cold water to stop the cooking process. 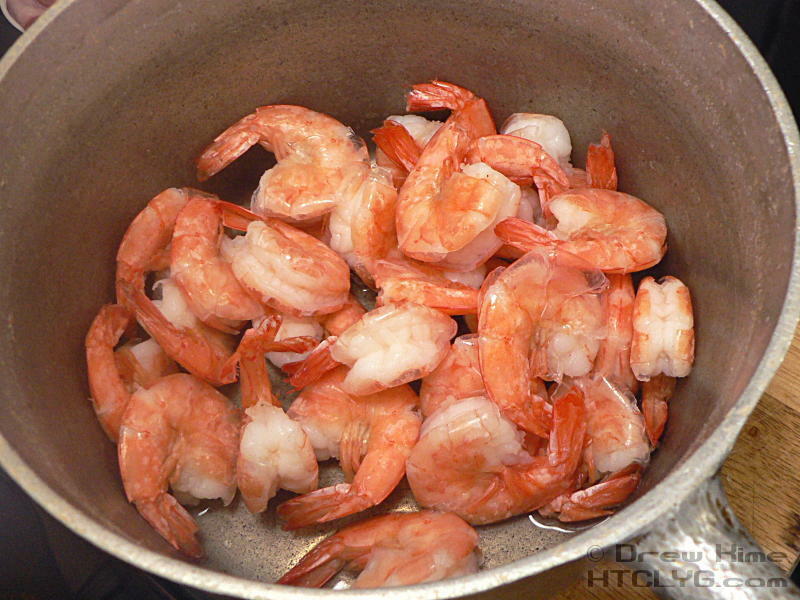 Don’t overcook shrimp or it will get rubbery. 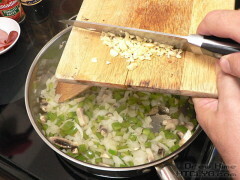 Peel the shells and chop into bite-size pieces. 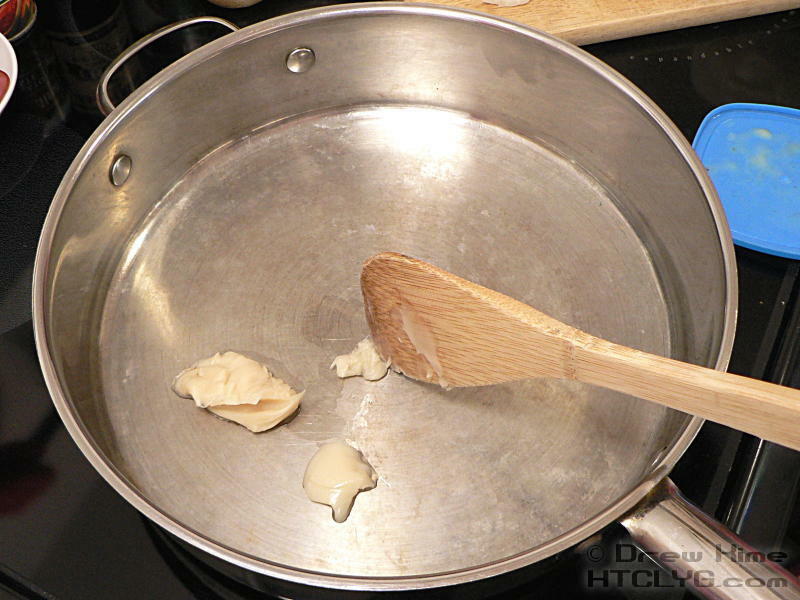 Melt a few tablespoons of butter or bacon fat in a large non-reactive pan — stainless steel or porcelain coated, but not raw cast iron (unless you’re really confident in the season). 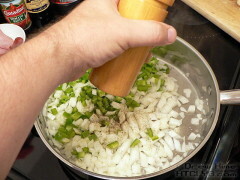 Add the onion and pepper, and season with salt and black pepper. Chop the mushroom roughly, mince the garlic and add both. Here’s where traditionalists are probably going to have a problem with this. 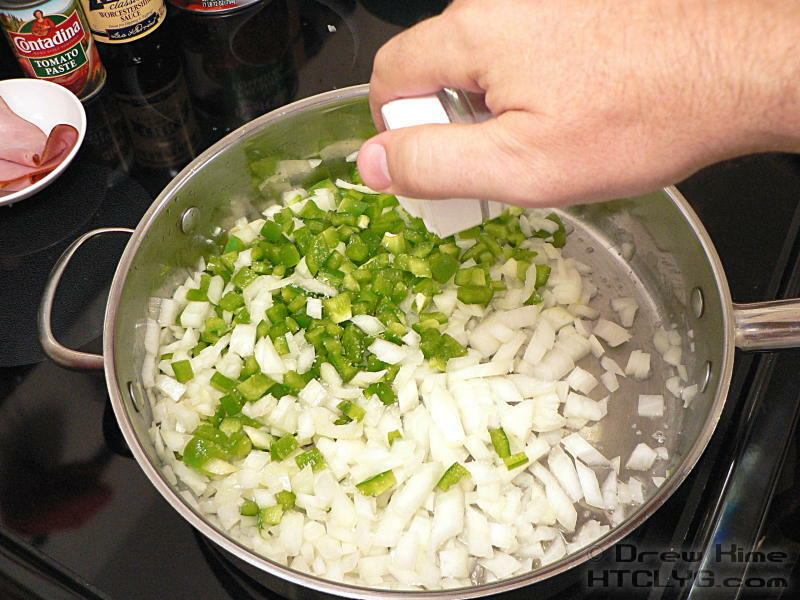 I’ve seen recipes that call for no pepper. Some say crushed red pepper, or cayenne, or Tabasco — which is cayenne with vinegar. 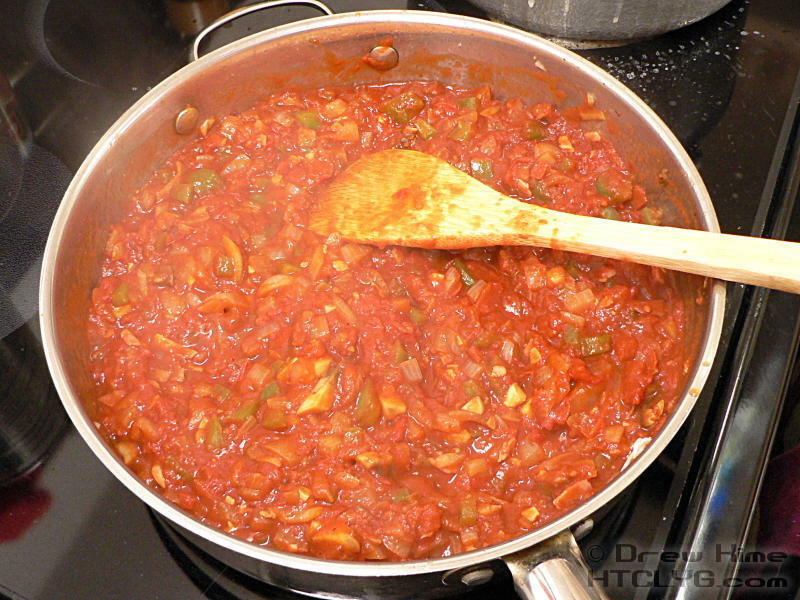 I went with about a teaspoon of chipotle, which is made from roasted jalapeños. 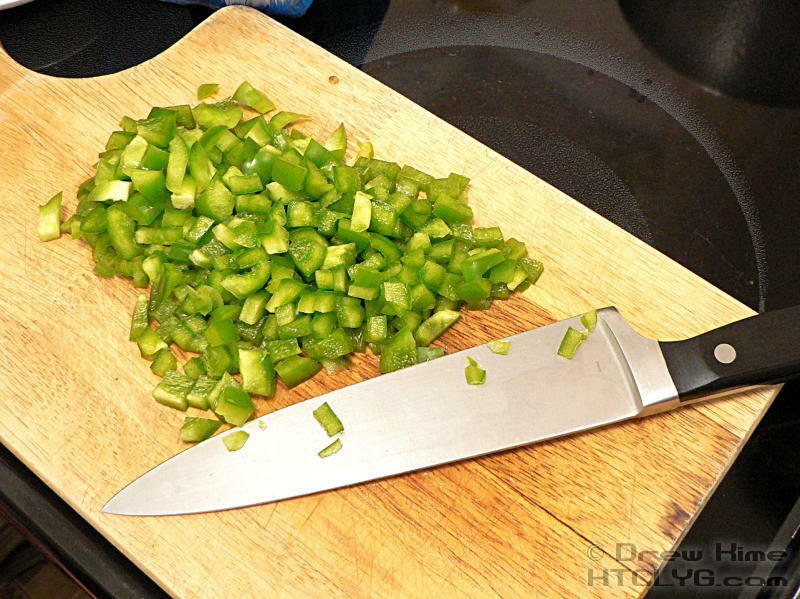 You can obviously go with more or less pepper, depending on how spicy you like it. 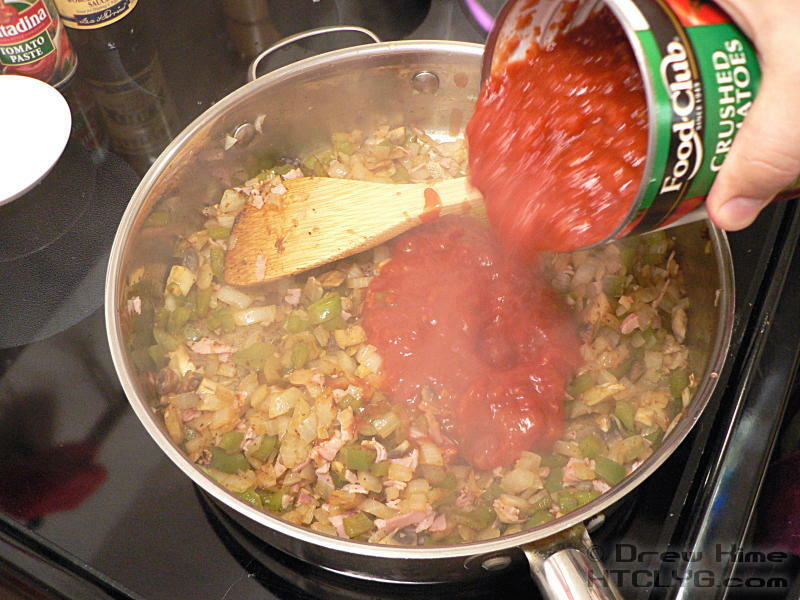 Just remember that it’s easy to add more, but pretty hard to take pepper out if you overdo it. 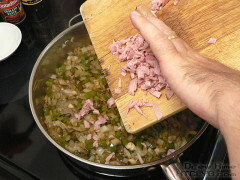 Mince and add the ham. 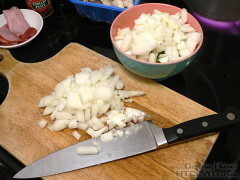 You can see in that lastÂ picture that the onion and pepper are thoroughly softened and starting to brown. If you did a mise en place — that’s just French for “set in place”, meaning you prepped everything all at once before you started cooking — you’ll have to cook for a while before adding the tomatoes. If you chop as you go, and stir after each addition, there should be plenty of time for everything to cook along the way. Now that all the veggies are cooked, stir in the tomatoes and the Worcestershire sauce. Once the tomatoes are heated through, remove it from heat and stir in the shrimp. Serve over white rice. 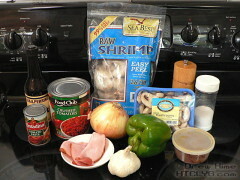 (Unless you’re on a low-carb diet, in which case serve with blackeyed peas. Boil the shrimp in salted water for about 10-12 minutes, until bright red on the edges and there is no gray color left. 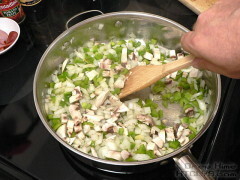 Drain, and rinse under cold water to stop the cooking process. Peel the shells and chop into bite-size pieces. Melt a few tablespoons of butter or bacon fat in a large non-reactive pan. Dice the onion and pepper, season with salt and black pepper and add to the pan. 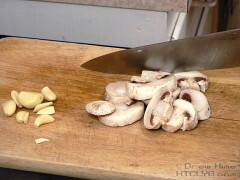 Chop the mushroom roughly, mince the garlic and add both. 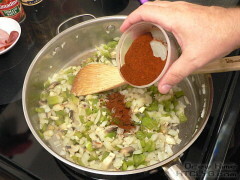 Add the chipotle powder. Mince and add the ham. 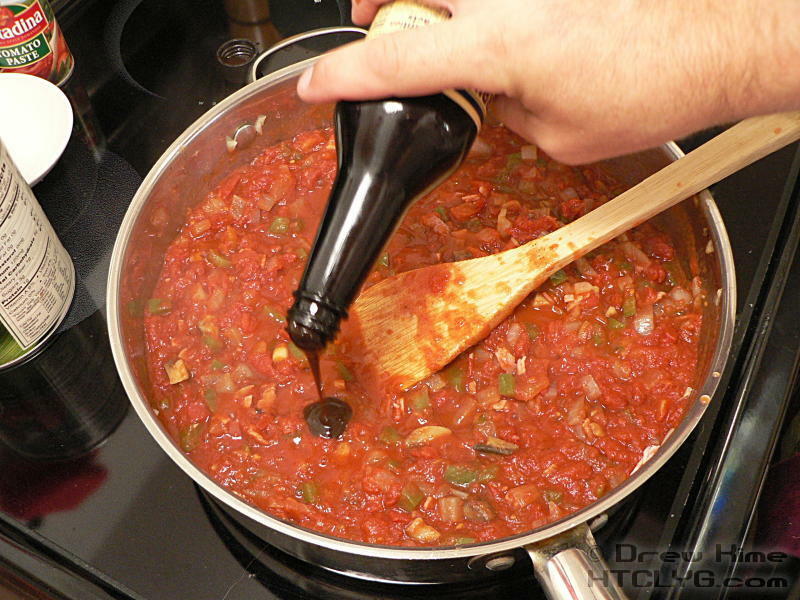 Cook over medium heat until the veggies are softened and starting to brown slightly, then stir in the tomatoes and the Worcestershire sauce. Heat through, remove from heat and stir in the shrimp. Serve over blackeyed peas or small white beans.